Do you remember a few years ago how young people wearing hoodies were being vilified by politicians and the media? Some brilliant people at Frontier Youth Trust did some research that found that adults overestimate the level of antisocial behaviour by young people and teenage pregnancy and decided to make a statement about it. 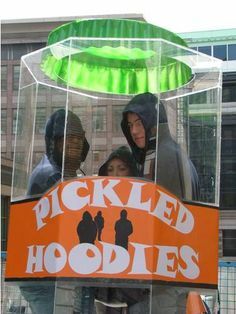 They made a 7ft high jar, put some young people in hoodies in it, and drove it down Fleet Street to publicise the research that was entitled ‘Labels R4 Jars – Not Young People’. We label people all the time. We categorise them by gender, sexuality, age, ethnicity, musical preferences, job, unemployment, disability and in so many more ways. Laziness – it is easier and more convenient to stick a label on someone and assume that we therefore know all about them than to get to know them as an individual. Self-esteem – if we label a group of people pejoratively it makes us feel better about ourselves because we are better than all of them. Prejudice – yes, let’s name it and admit it, even though we may not like it about ourselves. Peer pressure – this can sometimes be an excuse, but when everyone else is labelling others it is easier to go along with it than stand against it (think about your attitude towards ‘greedy bankers’ and ask whether that is an informed opinion or a label conveniently stuck on by others that we have accepted). One of the MANY things I love about Jesus of Nazareth is that he did not label people. He saw people as individuals not as needs. He was not lazy or sloppy in getting to know people. He did not need to boost his self-esteem by looking down on others. He was not prejudiced. He did not give in to popular opinion. Except (and I hope some of you have already got here) he did label some people, didn’t he? Look at what he had to say about Pharisees and teachers of the law. He spoke about them as a category. He made sweeping statements about them. He labelled them. I am sure that when he spoke generally about them being hypocrites who were like whitewashed tombs – looking good on the outside but rotten and hideous on the inside – there would have been some who were genuinely trying to do their best and were not hypocritical. So what are we to make of that? Well, I suppose it is always true that the nature of a generalisation is that it will not always be true of everyone. And we need to bear in mind that the Pharisees were a religious group along the lines of a political party who shared the same ideology and it was the ideology that was under attack. Those make me feel slightly better about Jesus’ approach. And it’s also fair to say that his criticism hit the nail on the head of what was wrong at the heart of this ‘party’. But what makes me feel even better was that he had as much time to spend with Pharisees and teachers of the law, trying to explain to them what God was really like as he did with those whom the religious system classed as ‘sinners’ and ‘unclean’. Even though he was willing to use polemical rhetoric as a way of drawing attention to the injustice, inequality and hypocrisy of the prevailing system he also sought to engage with those who were his opponents (and later saw themselves as his enemies). Read John chapter 3, where Jesus spent time explaining things to Nicodemus, a Pharisee and member of the ruling Council alongside Matthew 23 where Jesus warns against hypocrisy and unloads both barrels against the Pharisees. It is right that we protest against systems, injustices, and those in authority when they are acting in a way that is out of step with God. It is right to speak out for those whose voice is not heard. It is right to challenge and make people think about their attitudes. But it is also right to engage with all people as people, not labelling, not making assumptions, not being lazy, denigrating, prejudiced or simply going along with the flow. Let’s show Christ-like integrity in the way we are with everyone – loving everyone equally.